(CNN) -- Bubba Watson and South Africa's Retief Goosen took the halfway lead at the $6.4 million Quail Hollow Championship as Tiger Woods slipped into a tie for third. 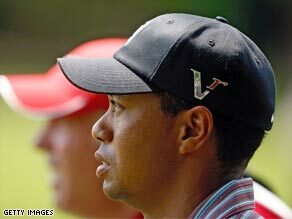 Woods in reflective mood as he waits to play a shot on the 7th at Quail Hollow. Woods had a two-shot advantage heading into the second day in North Carolina, but could only manage a level-par 72 with a poor finish as he bogeyed the 16th and 18th. But he is still only a shot behind Watson and Goosen who are on eight-under 136. "I didn't hit it very well," admitted Woods, who is tied with Zach Johnson (67), Jim Furyk (66) and George McNeill (68) on seven-under 137. "I didn't drive the ball particularly well, didn't hit my irons as well as I'd like. "I was hanging in there and if I could have posted nine (under) I would have probably gotten the most out of that round. "It just didn't work out that way but overall it's not that bad, considering the way I was hitting the ball," he told the official PGA Tour Web site. Watson matched Woods' first round of 65 with an incredible burst on the front nine, his inward half which he completed in six-under. Former U.S. Open champion Goosen carded a 68. World number two Phil Mickelson, who can leapfrog Woods for top spot with victory at Quail Hollow, carded a one-under 71 to join Jason Dufner, Jeff Maggert and Colombian Camilo Villegas on six-under. The cut fell at even-par 144 with this year's Masters champion Angel Cabrera and Ireland's 2008 double major winner Padraig Harrington both missing out.